We started the day off with one of my very favorite parts of the entire trip. 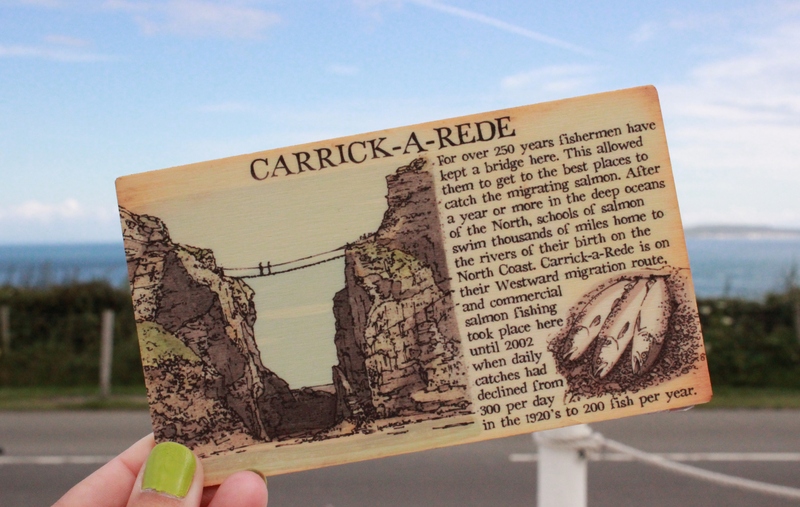 A bit north of Belfast you’ll find the Carrick-a-Rede (“rock in the road”) rope bridge, which used to be put up seasonally so fishermen could get further away from the shore where the salmon fishing was best. The 20-meter bridge connects the mainland to a small island just off of it. If you want to go, the current cost of an adult ticket is £5,60, with discounts for families and children. My tip is to go in the morning before all the tour groups and other tourists get there. I also recommend wearing grippy shoes because some places can be quite slick if they’re wet. 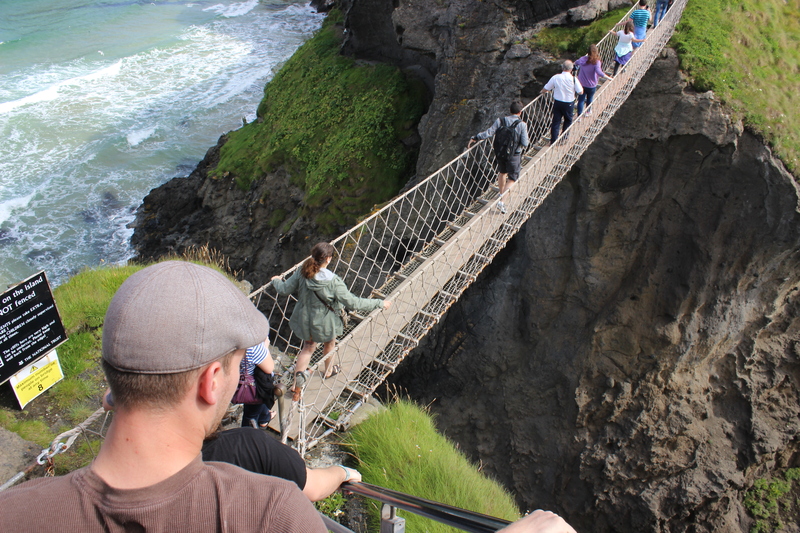 I didn’t find crossing the bridge to be daunting at all, but if you’re afraid of heights it might be a little scary since it hangs 30 meters above the crashing waves below. We couldn’t have been luckier with the weather – the sun shown down in big bright patches between the clouds, making the whole landscape look like something from a fairytale. 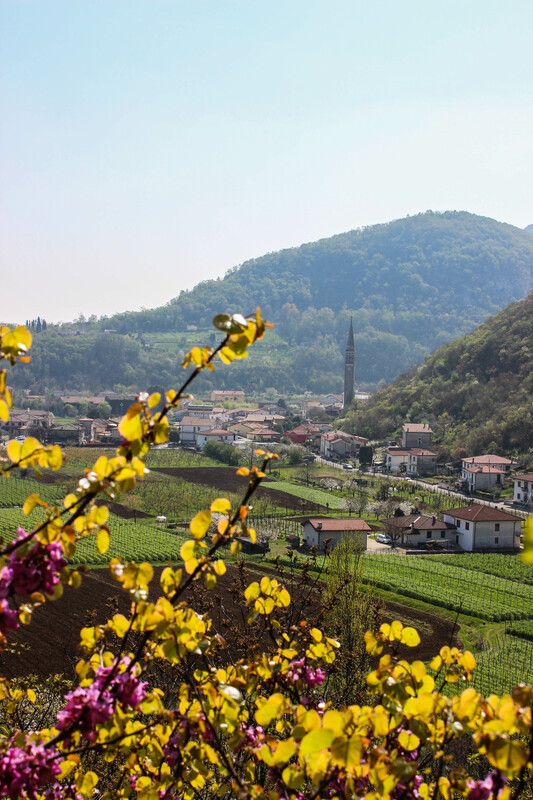 And of course, the landscape itself was breathtaking. 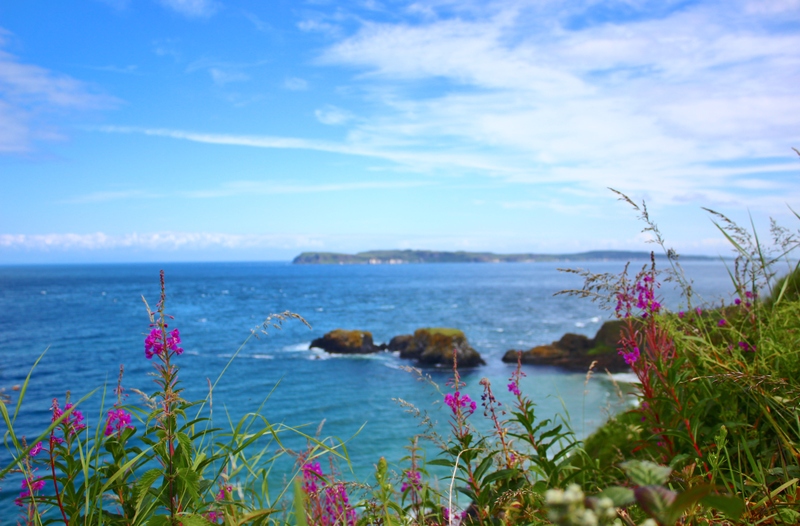 The walkway down to the bridge is about a kilometer, and along the path on one side there are cliffs with cold blue water and islands off the shore, while on the other side are rolling green pastures and wildflowers everywhere. 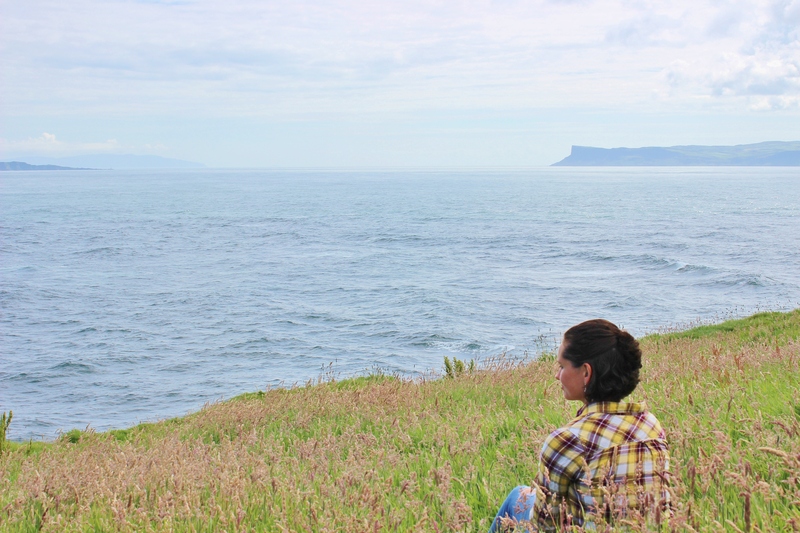 Across the north channel, you can spot an island and beyond that in the distance you can even see a bit of coast belonging to Scotland. It was a perfect place, and now I’ll let the pictures speak for themselves. 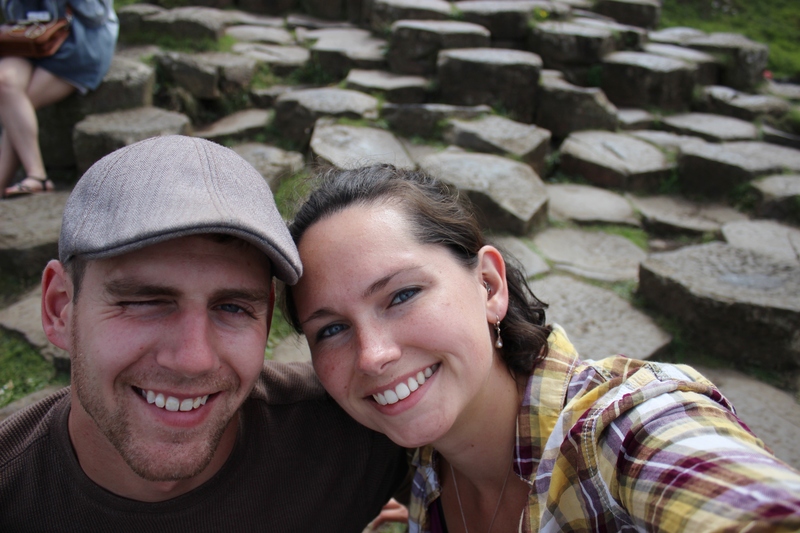 I’m sure all of you have heard of the Giant’s Causeway. 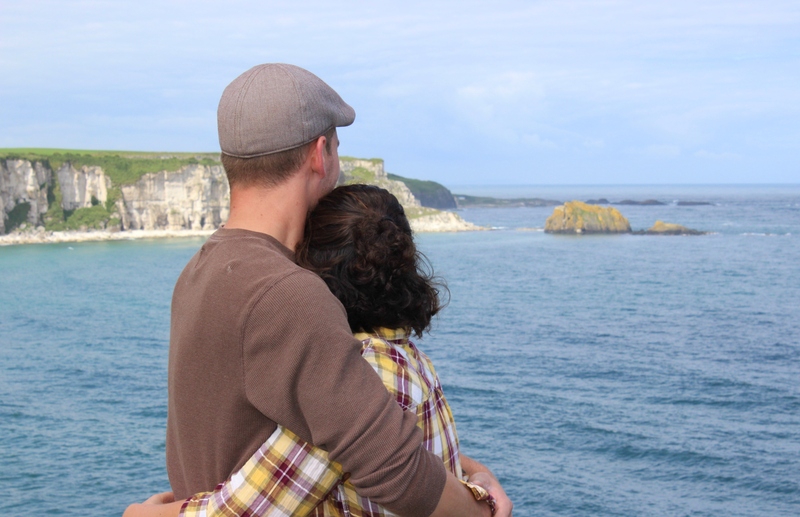 It’s actually quite close to Carrick-a-Rede, so doing them in the same morning is no trouble. 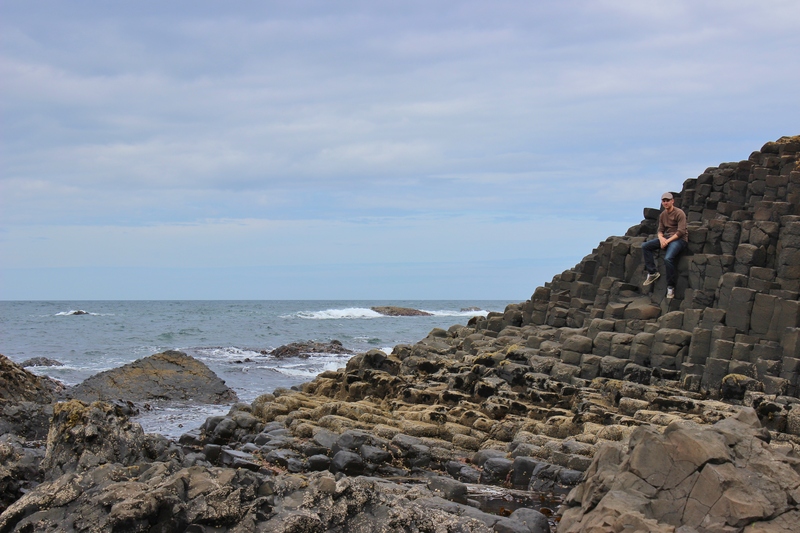 The Giant’s Causeway is a small area of the northern coast where there are thousands upon thousands of hexagonal columns coming out of the earth. These strangely-shaped rocks were supposedly created over 50 thousand years when a lava plateau cooled and condensed, causing horizontal fractures. Our driver said that despite the theories, no one knows for sure how the phenomenon happened. The more interesting story, however, comes from Gaelic myth. 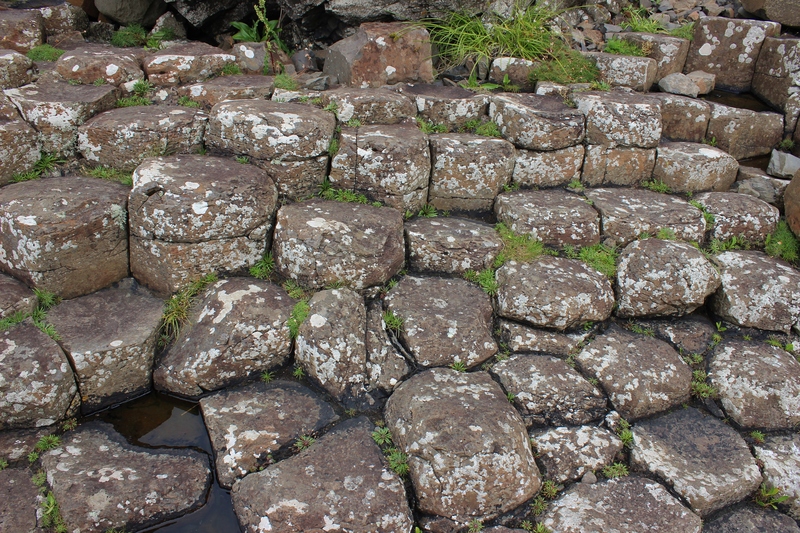 Long ago, the causeway was built by a giant (some say it was the Irish hero of legend, Finn MacCool) and it connected the coasts of Ireland and Scotland (where you can still find the matching stones today at Fingal’s Cave). There was a Scottish giant named Benandonner, with whom Finn decided to pick a fight. 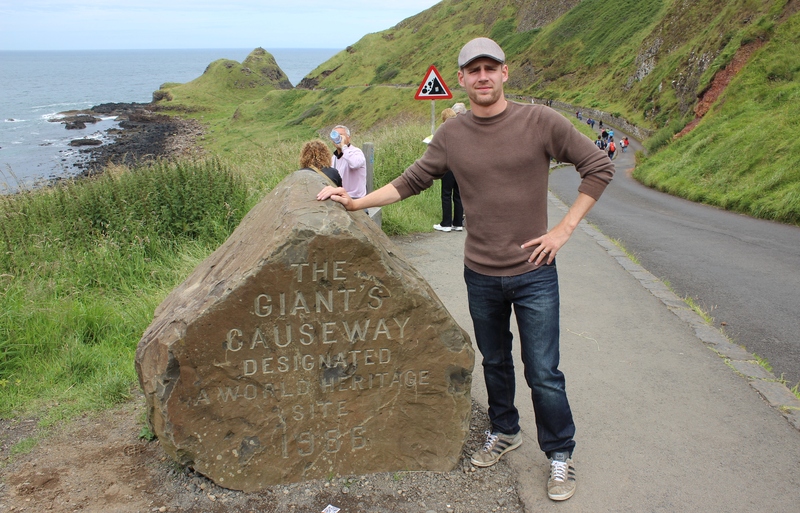 When he saw Benandonner coming across the causeway, he realized that he was no match for the Scottish giant’s size. Finn MacCool ran home to his wife Oonagh, who hatched a plan. She dressed Finn up as a baby and put him in a cradle. When Benandonner reached Finn’s home and saw the massive size of this infant, he decided he’d better get away because the full-grown father returned. Some say that Benandonner destroyed the causeway on his way back to Scotland. Others say that Finn MacCool threw rocks the size of islands after his enemy, destroying the causeway. Apparently Finn’s aim wasn’t so great though, because one of the rocks he threw went way off-course and became the Isle of Man. 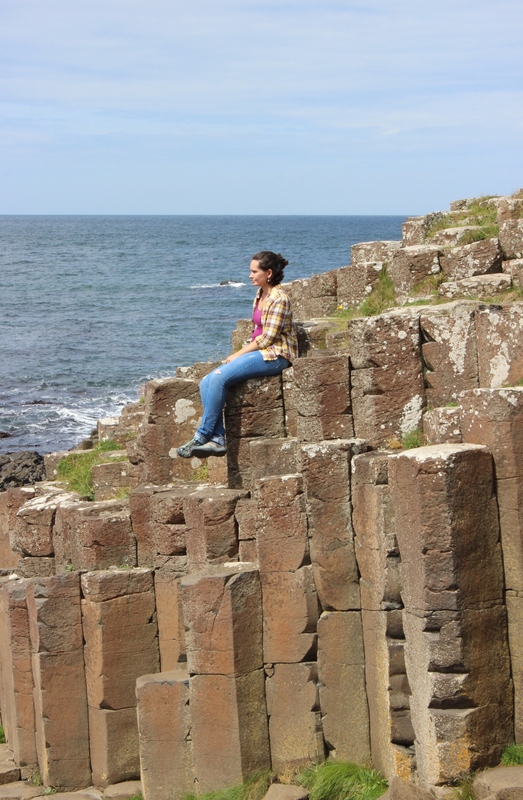 The Giant’s Causeway was pretty interesting, but I have to admit it wasn’t what I expected. 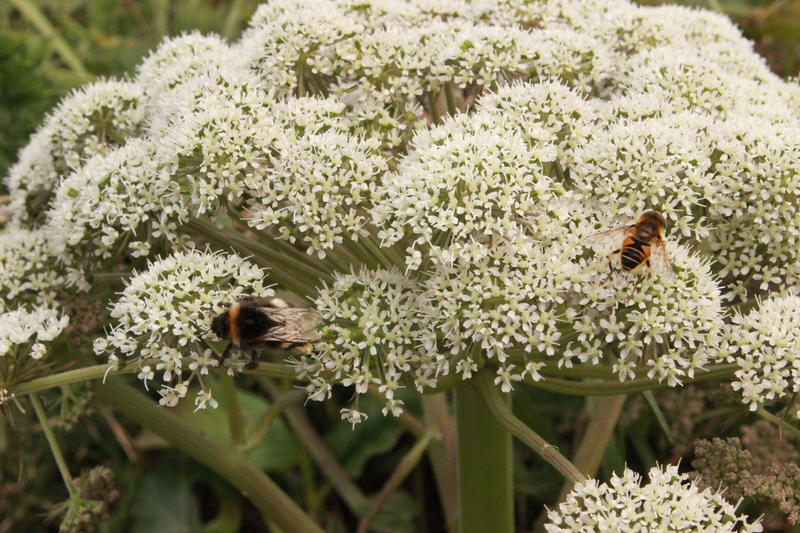 Firstly, it was crowded! I pictured a more rural and serene area, which was not the case at all. Again, I’d say go early if you can because by the time we got there it was early afternoon. 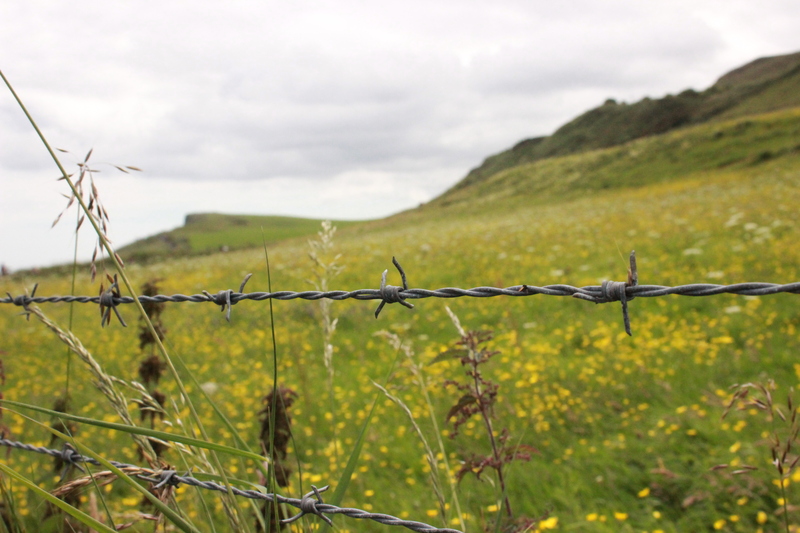 To see the Giant’s Causeway is free – it’s a bit of a walk down to it, and it would be a very steep walk back up. If you’d rather not walk, there are buses that run back and forth for £1. We walked down and took a bus back up for the sake of time. Where you could end up spending money is at the visitor’s center. I believe our driver said it was an £8 entry fee, which is pretty ridiculous. However, there are toilets just inside the entryway if you need them, and you don’t have to pay the fee to use them. 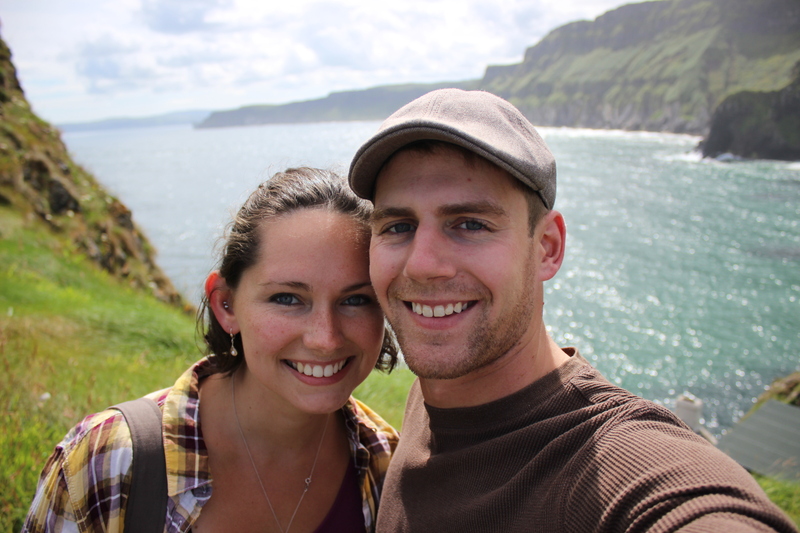 After the Giant’s Causeway we were headed to the city of Derry. 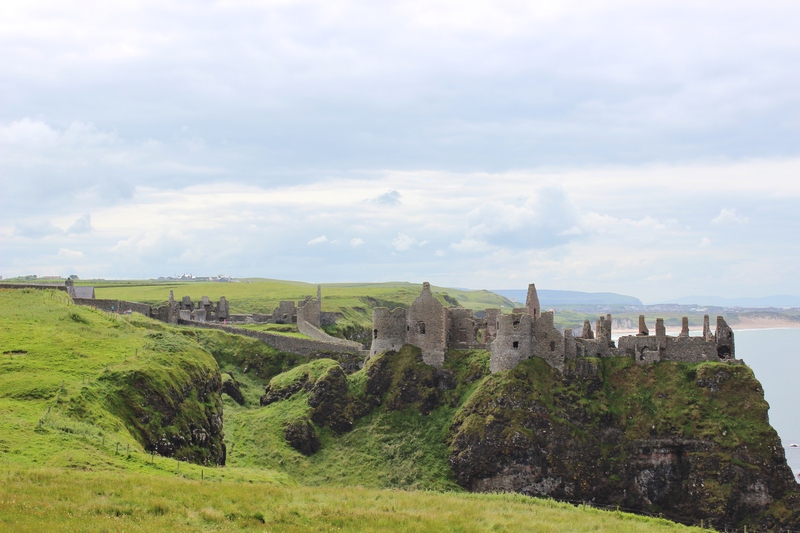 Luckily, our driver made a stop along the way at a scenic point overlooking the medieval ruins of Dunluce Castle. 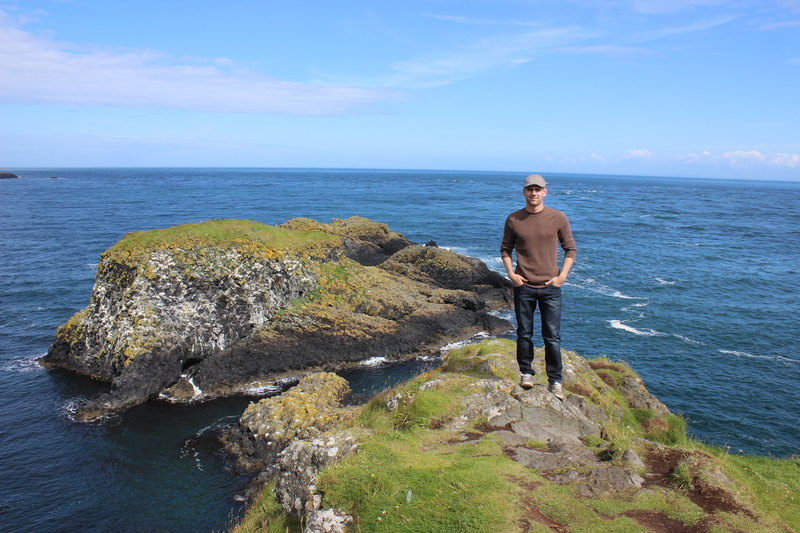 The castle was built in the 13th century along steep cliffs over the water. At one point in the 1600s, the kitchen of the castle collapsed into the sea, killing most of the kitchen servants. 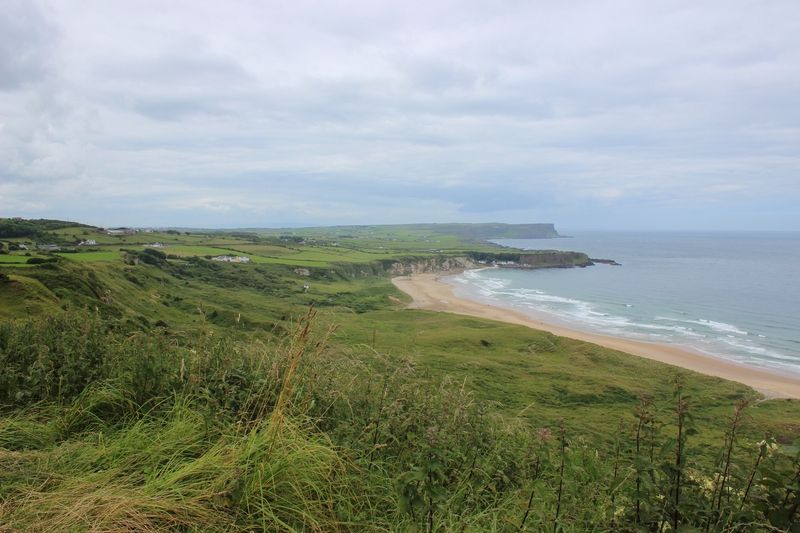 It’s said that the castle has been haunted ever since, though the McQuillan family who owned it in from the 1500s reported seeing a woman in a white dress appearing on the cliffs. Perhaps it has been haunted since the very beginning. That evening we arrived in Derry and stayed at the Serendipity House B&B, which was adorable and the owners were lovely. We got lucky and ended up with the best room in the house (request room number 5, if you stay there) overlooking most of the city. Check out this view! We promptly set off on our free walking tour. Damien, who goes by D (only the cops and his mother call him Damien), gave us a very good historical tour of the Troubles in Derry. Firstly, let me start by explaining that the city has two names. Derry to the Irish/Catholics, and Londonderry to the British/Protestants. During the Plantation of Ulster, the city was renamed Londonderry by the English and Scottish settlers in honor of the crown, and the name was made official in 1613. The Irish have always rebelled against this. 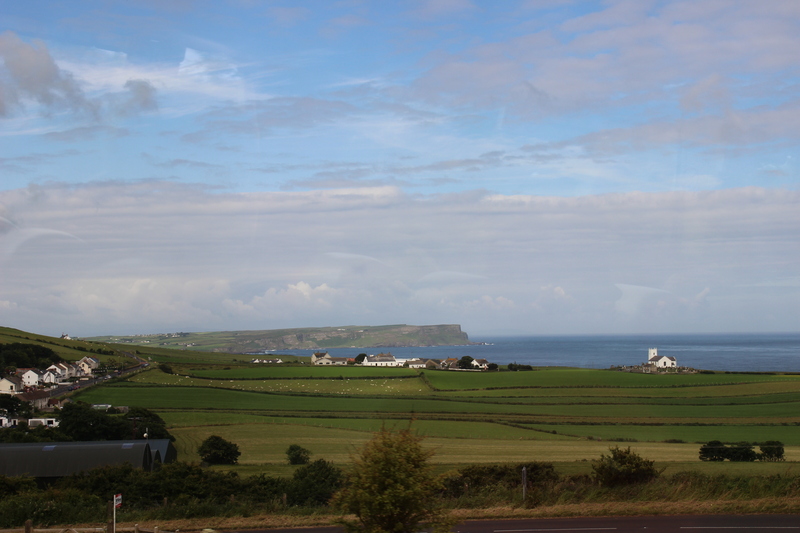 In the original Irish the name of the city is Doire (“durrah”) or Daire (“darrah”), and many, including our guide, still vehemently call it Doire. The tour we received from D was remarkable in a lot of ways. Firstly, unlike the Black Taxi drivers of Belfast who never let you know which side of the Troubles they’re from, D was very outspoken about being pro-Irish, pro-Derry, and anti-British. This may sound like a bad thing, because obviously the information we were getting was biased. However, I thought it was invaluable to hear from someone who grew up during the height of the Troubles and could really give us insight into how Irish Catholics live and feel today. 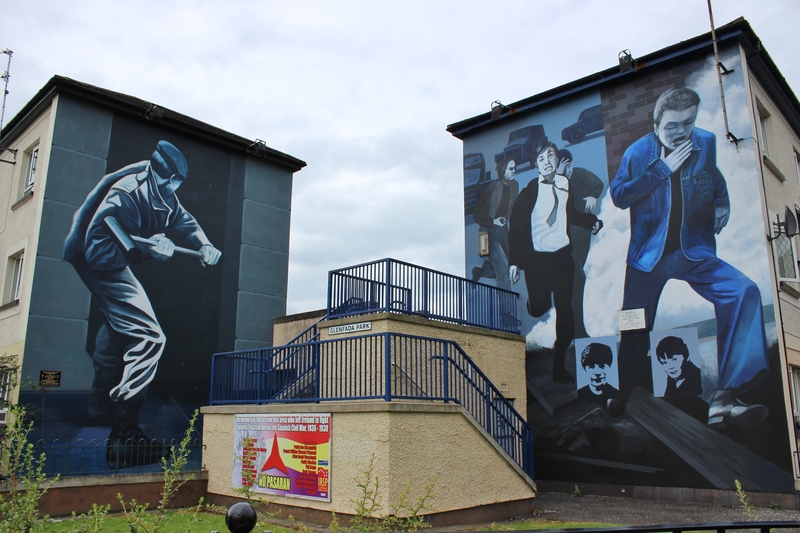 Our tour went through the Bogside neighborhood of Derry where we saw many more murals like the ones in Belfast. These, however, struck me as a little different – they were a little less imaginative and looked more like snapshots taken during the clashes. D told us later that most were painted from memory. I found the effect more haunting than those in Belfast, because they seemed more real. You can look for yourself. 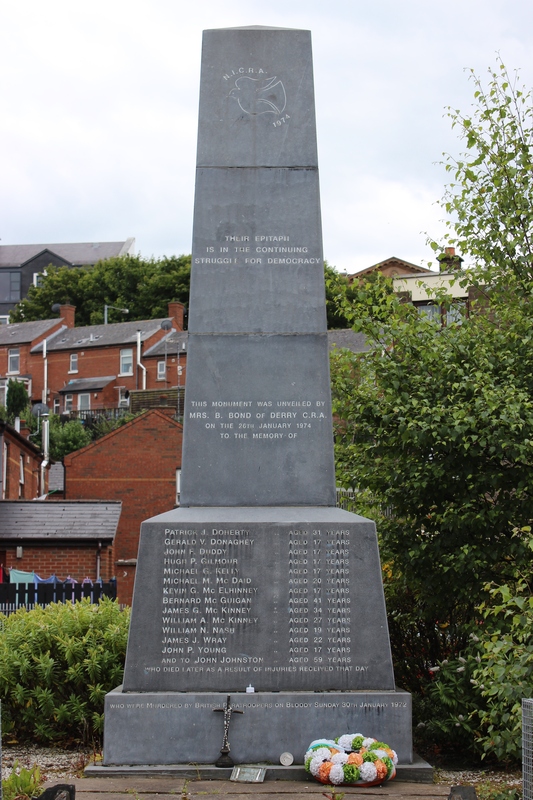 D told us many stories during our walk, but the Battle of the Bogside in 1969 was the clash most regarded as setting off the worst of the Troubles across Northern Ireland. 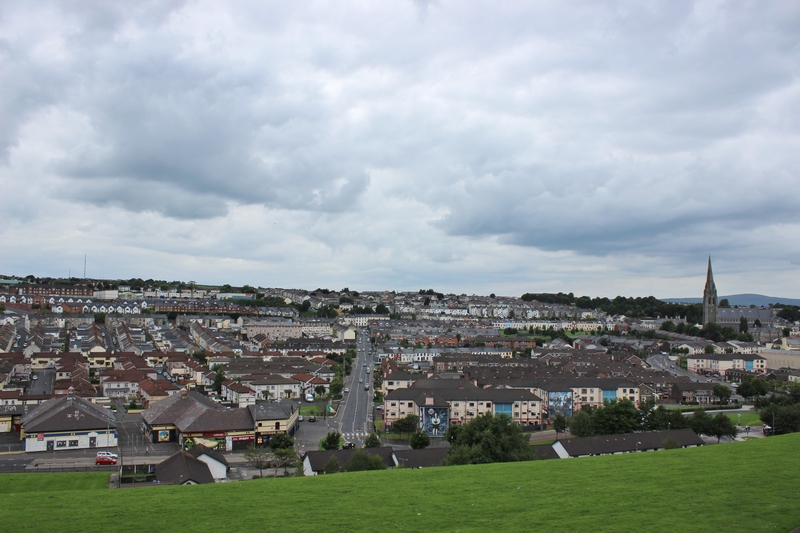 The Battle of the Bogside was a brutal 3-day riot during which the Bogside neighborhood, backed by the IRA, fought against the Royal Ulster Constabulary. The RUC was never actually able to enter the Bogside and eventually the British army was called in to restore order. At first the military was welcomed by everyone because the fighting had stopped. However, according to our guide, within a few years they had started to overstep their boundaries; excessive force, theft, and favoritism became business as usual. D recounted that before the Battle of the Bogside, there used to be a man of the neighborhood who would sit outside his house holding a “You are now entering Free Derry” sign for passersby (especially Protestant ones) to see. Today you’ll see it in huge letters on the side of what used to be a house that was destroyed during the fighting. 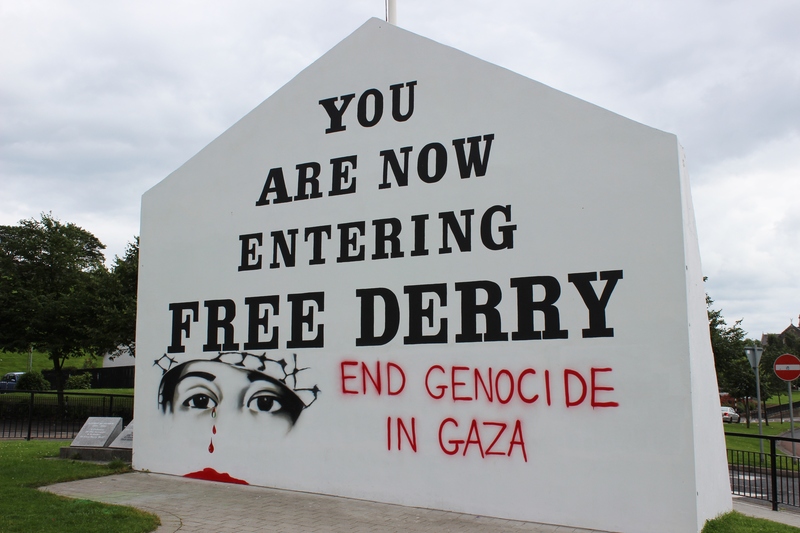 A local has added “Stop genocide in Gaza.” This spot is now known as Free Derry Corner. 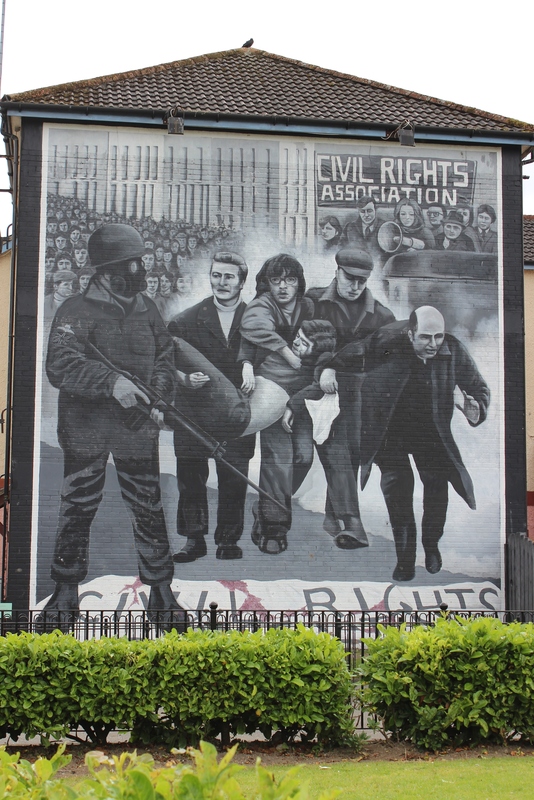 Possibly the most well-known episode of violence during the Troubles was the Bloody Sunday massacre of 1972. The incident again took place in the Bogside area where thousands of Catholics had come to protest unfair treatment. (As I mentioned in my last entry, Catholics faced discrimination in voting rights, housing, and job opportunities.) No one is sure of the number of protesters, though estimates say between 15 and 30 thousand were in attendance. The British army (who had been brought in to restore order three years earlier, you’ll remember) was there to keep the peace, and were armed with rubber bullets and gas grenades. Things were going alright until someone fired into the crowd using a live round. Naturally chaos broke loose and in the end, 26 civilians were shot. Of those, 13 died that day and a 14th from his injuries a few months later. Many of them were shot as they ran from the British soldiers, or as they tried to give aid to the fallen. Seven were under the age of 18. None were armed. When asked what happened, the commander in charge of the British troops, Major Ted Loden, claimed that they were only responding to a shot fired by the protesters, and that they had only fired a few rounds. A recent inquiry into the incident was completed in 2010, and it found that the British army was indeed at fault for the events of that day. The report admitted that the protesters had not presented a threat and in light of this conclusive information, British Prime Minister David Cameron issued a formal apology. D assured us that despite all the violence that has occurred in Derry, it is nothing like it was just 15 short years ago. “Fifteen years ago,” he said, “I never thought I’d want to have a family here. Now, there’s no where else I’d rather live.” D has five children and says that Derry has become a wonderful city to live in. The tension is far from gone, but the violence is over and Catholics and Protestants live peacefully side by side, unlike in Belfast where they remain separated. 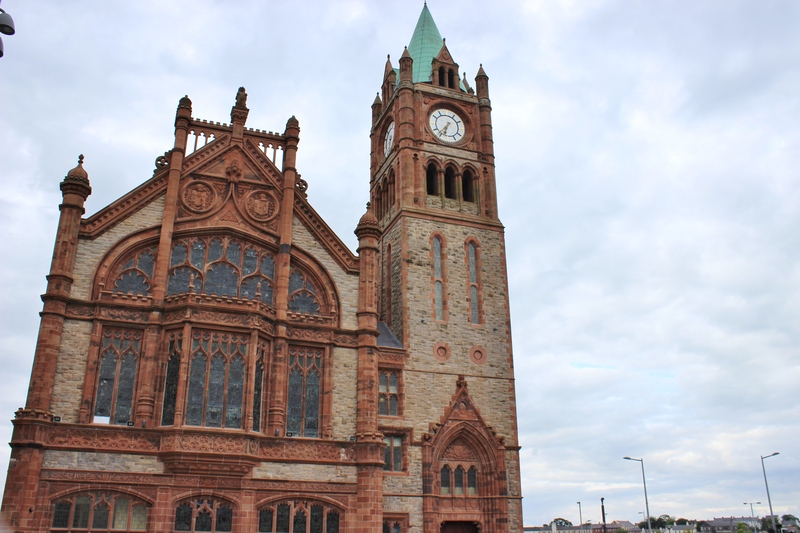 In fact, Derry was awarded the title of UK City of Culture in 2013. 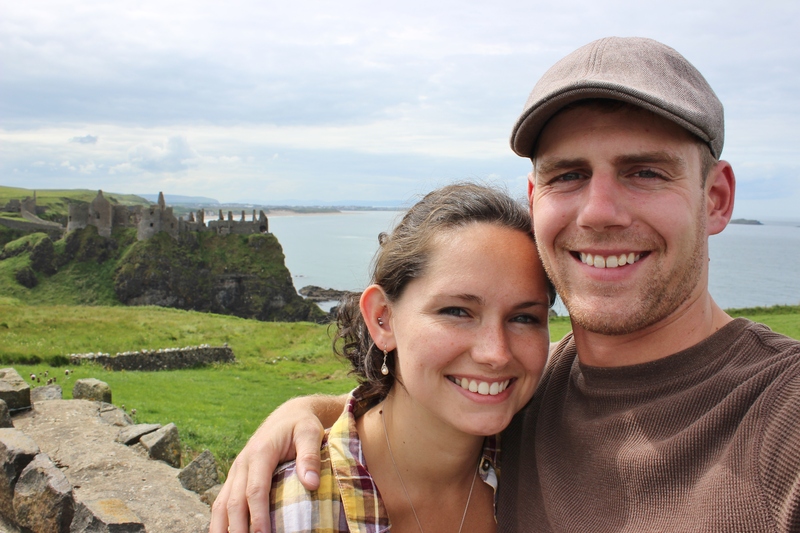 Once we got through the tear-jerking tour, we were able to relax with dinner and pub-hopping. I highly recommend Peadar O’Donnell’s pub for good beer and better music. However, if you’re looking for cheaper drinks the place to go is the Ice Wharf (a franchise of J.D. Wetherspoons). The beer there was in the £3 range when normally a pint will cost you over £4. 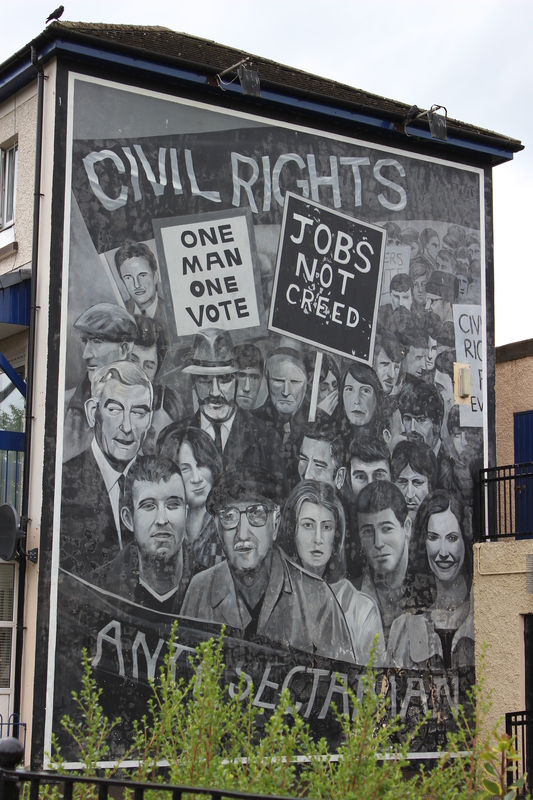 Overall, I think it’s fair to say that Derry has a heartbreaking past, but a brilliant future. It ended up being Alex’s favorite town, and I was surprised by how much I liked it myself. 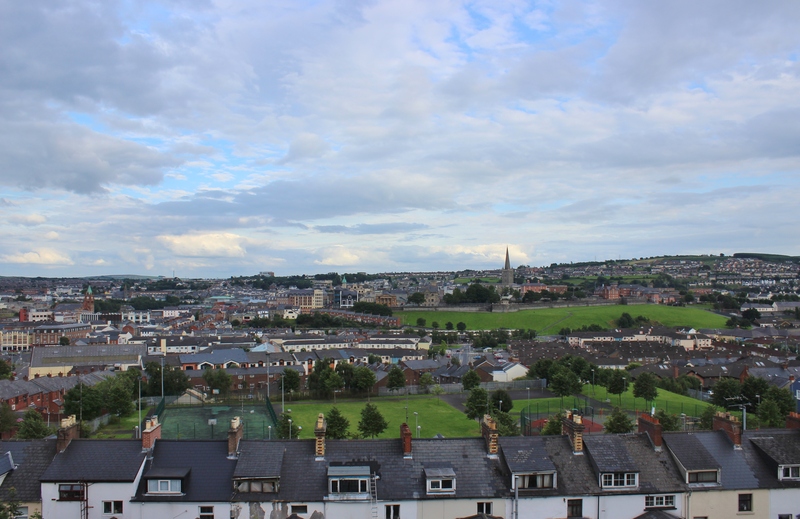 I’m not really a city person anyway, but Derry has a lot of character and I’d love to go back and see more of it. 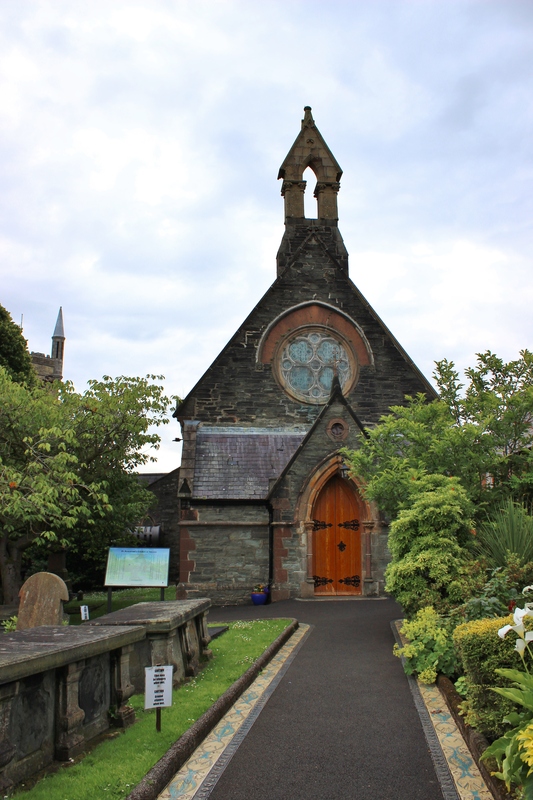 My next entry will be about our third day with Paddywagon – Yeats’ grave and a pub crawl in Galway! 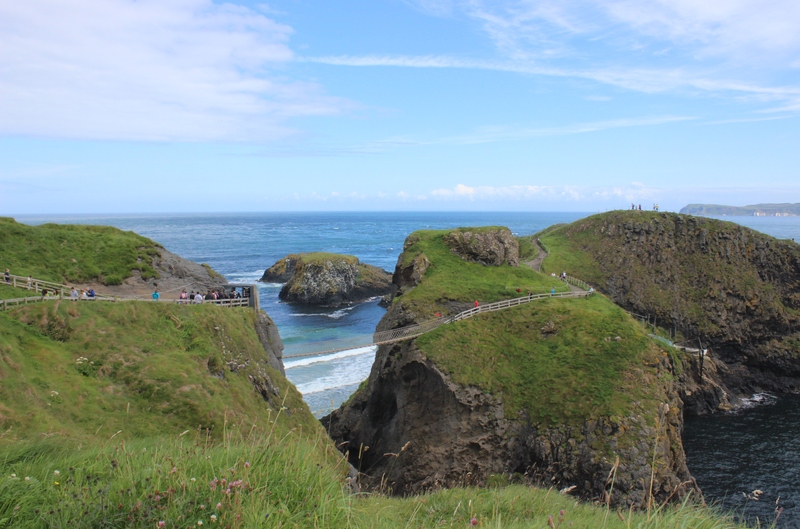 This entry was posted in Ireland Adventure, Travels and tagged Bloody Sunday, Bogside, Carrick-a-Rede, Derry, Giant's Causeway, Ireland, mythology, rope bridge, Scotland, troubles. Bookmark the permalink. Beautiful photos and very good description. Good to travel and see the world. Thank you for sharing the trip. Thanks so much! I’m happy to share my experiences with everyone. And (hopefully) give good advice to the next travelers! the issues. It was truly informative. Your website is very helpful.